To download a free trial copy of ConceptDraw software, first of all, you need to register. Please Sign In at the ConceptDraw website. Fill out the registration form and follow the steps to activate your account. Once you have activated your account you are then able to download and install ConceptDraw products as well, as solutions from ConceptDraw Solution Park. What are the limitations of the trial the version? For 21 days the trial functions exactly like the purchased product. There are no limitations to file size, how many times you can print, or any of the functionality of the product. We want you to be able to try using actual work conditions. What happens after the trial period expiration? After the trial period expires, the functionality of saving, export, outputs (for ConceptDraw MINDMAP) and printing are not available. You will be able to open ConceptDraw documents to view. To save your work once your trial expires, you will need to purchase a license. What if your trial expires and you are not able to save your document? To save your work if your trial expires, go to our online section labeled Purchase and purchase a license. You do not need to download ConceptDraw software again. 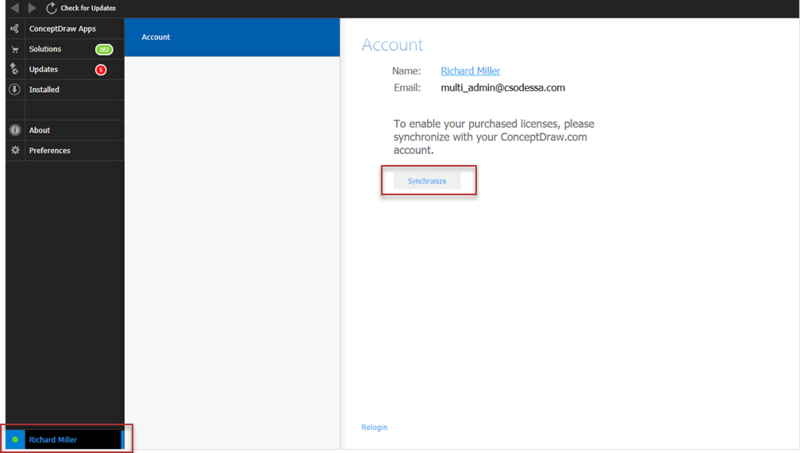 Your license key will be added to your ConceptDraw account. Just run the ConceptDraw STORE, open profile tab and click the Synchronize button. This will refresh your license info.